The global war for top talent has made it necessary for universities to deploy new tactics in securing top minds and Wits is delving even deeper into the pool to identify top learners – the talent that will enable the University to retain its competitive edge and make inroads into new knowledge territory. This weekend Wits launched Future Witsie, a programme geared towards high school learners with the intention of recruiting the best high school learners to Wits. The crème de la crème from Wits’ top feeder schools in Gauteng attended Saturday’s launch of the exclusive programme open to promising talent. 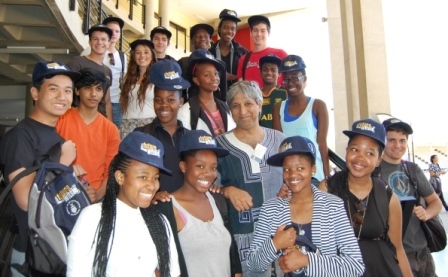 Wits Vice-Chancellor and Principal Professor Adam Habib and representatives from the university’s five faculties spoke candidly to the learners about the intended outcome of programme. “The top 100 students have options and they can go anywhere but we brought you here today to show you what Wits is really about,” said Habib. Habib advised the students to ask key questions when choosing institutions to study at and base their decisions on fact and not perception. “A university may have a good global ranking but this does not mean that all of its academic programmes are number one,” said Habib. Habib shared some of Witsies’ recent achievements. “Wits is the University of Helen Zille, Joe Slovo, Ruth First, Patrice Motsepe, Adrian Gore and Nobel Laureates such as Nelson Mandela and Nadine Gordimer,” he told learners and parents. Research shows that students who excel academically and culturally not only complete their undergraduate degrees on time but they progress to postgraduate studies. Wits intends to increase its postgraduate student population to 50% of the total student population in the coming years. The Future Witsies programme is a creation of the Schools Liaison Office who has identified key interventions to support the University’s ambitions and demand for top talent. Part of their artillery is to develop relationships with top high school learners much earlier than is tradition. Membership to the Future Witsies programme is by invitation only and is open to Grade 11 learners who are nominated by their schools to join the programme. The learners have to excel academically or demonstrate exceptional sports, cultural or leadership capabilities. The perks include a goodie bag with club branded items, exclusive invitations to Wits events; ongoing communication from Wits; mentorship and much more. The launch of the Future Witsie programme was preceded by an event welcoming the country’s top matriculants (based on the Admissions Point Score calculated from Grade 11 results) who have applied to study at Wits in 2014.